UK supermarket chain Tesco is trialling new packaging for its fresh mushroom portfolio in order to keep produce fresher for longer as well as cut down on food waste. The trial of the new fully recyclable pulp punnet follows complaints from customers that existing plastic punnets sometimes put them off buying mushrooms, as the condensation that forms within in the punnets can deteriorat mushroom quality. The feedback from customers forced Tesco into rethinking its strategy for packaging mushrooms with extended shelf-life. The company is confident that the new punnet can extend the shelf-life of mushrooms and will help stores to reduce waste, meaning that customers will be able to store them for longer at home. Tesco also says that the pulp punnet can appeal to customers aesthetically, as they have a natural look. Not only is the pulp punnet in place for aesthetic reasons, but it can absorb moisture while, maintaining integrity. With plastic containers, as moisture cannot be absorbed, it condenses and sits at the bottom. According to Tesco, this is one small step towards its commitment to reduce food wastage wherever it occurs – from farm to fork. The company says that no food that could be eaten should be wasted. As part of its strategy to reduce food wastage, Tesco stated that no food that is safe for human consumption will go to waste from Tesco UK Retail operations by the end of 2017. 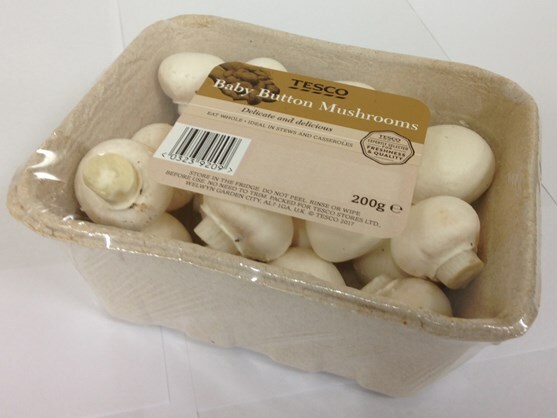 Image: Tesco’s new pulp punnet to store mushrooms. Photo: Courtesy of Tescoplc.com.